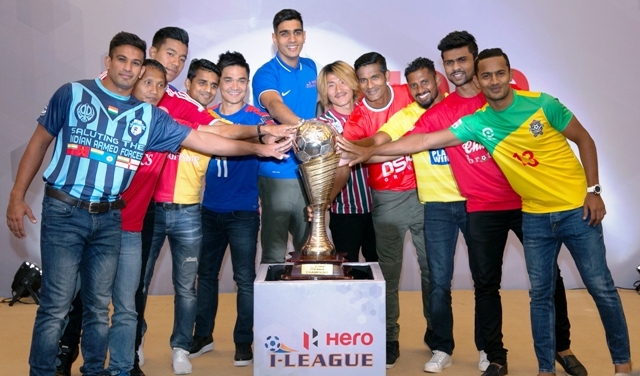 The official launch of the 10th edition of Hero I-League took place in New Delhi. The captains from the ten participating teams along with Indian International goalkeeper Gurpreet Singh Sandhu were present at the centre stage to unveil the glittering trophy. The league will feature the debutantes Minerva Punjab FC - who will be representing the state of Punjab after a gap of five years post the dissolution of JCT. The league will also feature Southern derby with new comers Chennai City FC and defending champions Bengaluru FC facing off against each other. Praful Patel, the president of All India Football Federation said, "The ten participating teams in the 10th edition of the Hero I-League are based from across the length and breadth of the Country. I thank Hero MotoCorp for their support to the I-League and Indian Football. The League is the unifying factor for the Football fans in India as right from Aizwal FC in the North-East to Mumbai FC in Mumbai, and from Minerva Punjab FC in Chandigarh to Chennai City FC in Chennai, the clubs represent pan India. The Hero I-League is the premiere league of the country through which teams participate in the AFC Cup and the AFC Champions League. I wish success to all the participating teams." The league opener will take place between I-League champions Bengaluru FC going up against Shillong Lajong FC on 7th January 2017. Mohun Bagan, Kingfisher East Bengal, Aizwal FC, Shillong Lajong, Mumbai FC, DSK Shivajians FC, Churchill Brothers FC, JSW Bengaluru FC, Chennai City FC, Minerva Punjab FC.